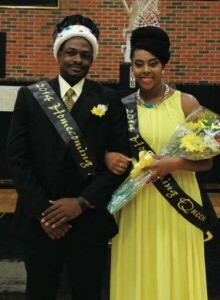 Lyndel Monrose and Karin Clashing-O’Reilly, both representing Students of the Carribean Alliance, pose for pictures after being crowned Homecoming King and Queen for 2014. Aggies rocked the campus Saturday, March 1 with traditions new and old during 2014 homecoming. “CU Rocks” themed homecoming week began Feb. 24, and ended March 1. From 8 a.m. – 5 p.m. at the Homecoming Hub in McMahon Centennial Complex Lobby, students gave tours to homecoming goers. For the first year also, there was a one-stop shop for campus tours, with homecoming details and information on events. At 9 a.m. on Saturday, the Aggie Family Fun Run began. Students could register at the McMahon Centennial Complex Lobby with parents and children. Participants walked, jogged and even strolled the mile to kick off the morning. For Men’s Tennis, 9 a.m. signified the beginning of a game against Ouachita Baptist in the Streich-Henry Tennis Complex. The Aggies later played East Central at 2 p.m.
Burch Hall hosted an Army ROTC Reunion at 10:30 a.m. 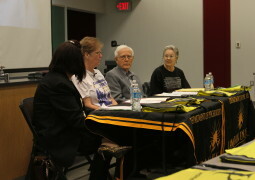 The George D. Keathley Department of Military Science held this event to reunite former members of the Comanche Battalion, Cameron’s award-winning Army ROTC unit. The Class of 1964, CUAA Award Winners, alumni and community members gathered for the Aggie Family Coffee at 11 a.m. in the McMahon Centennial Complex, to reflect on memories at CU. Students attended the Aggie Family & Friends Awards Lunch at noon in the McCasland Ballroom of the McMahon Centennial Complex. The Aggie family came together to present the Class of 1964 with their Golden Associate Medallions, followed by the presentation of the Cameron University Alumni Association Alumni Awards. The Aggies had new traditions, like the golf cart parade. Students from each campus organization decorated a golf cart and drove it from the MCC to the front of Cynthia S. Ross Hall. Students waited there with cookies and banners to wave. Fans filled the stands for the baseball doubleheader vs. Angelo State in McCord Field. Aggies young and old visited the concessions in front of the new softball complex and lined the bleachers to watch the Lady Aggies softball team play Eastern New Mexico. Chuckwagon Cook-off and Tailgate Party, adjacent to Aggie Gym, began at 2 p.m. Aggies brought blankets and hoodies to brave the cold for free homemade cobblers, chili and cornbread by a warm fire. Aggies voted for their favorite meal, and – after the homecoming candidates were introduced on a trailer with hay bales – filed into the gym for the Aggie game. Aggie basketball men and women played Midwestern State in the Aggie Gym. Teary-eyed seniors walked on to the court with family and friends as coaches presented them with pictures and flowers. Homecoming announcers recognized CUAA Award winners, Athletics Hall of Fame inductees, and homecoming King and Queen – Lyndel Monrose and Karin Clashing-O’Reilly. The aggies held up their pick axe signs after the game and greeted the players.